The Internet of Things is here. Devices in all industries are connected to one another, to a central backend or to control and diagnosis equipment. Consequently, they are increasingly exposed to unauthorized access and the risk of manipulation and spying. The potential damage this can cause companies and individuals is considerable. Specific applications, such as vehicle-to-vehicle communication, require advanced solutions not only to protect millions of vehicles with a decades-long lifecycle, but also driver privacy. ESCRYPT’s solution offers a fully automated process that enables secure communication – even if devices are connected for the first time. The solution is based on tried-and-tested cryptographic key management that is precisely tailored to embedded systems and corresponding device software for identity management and secure communications. 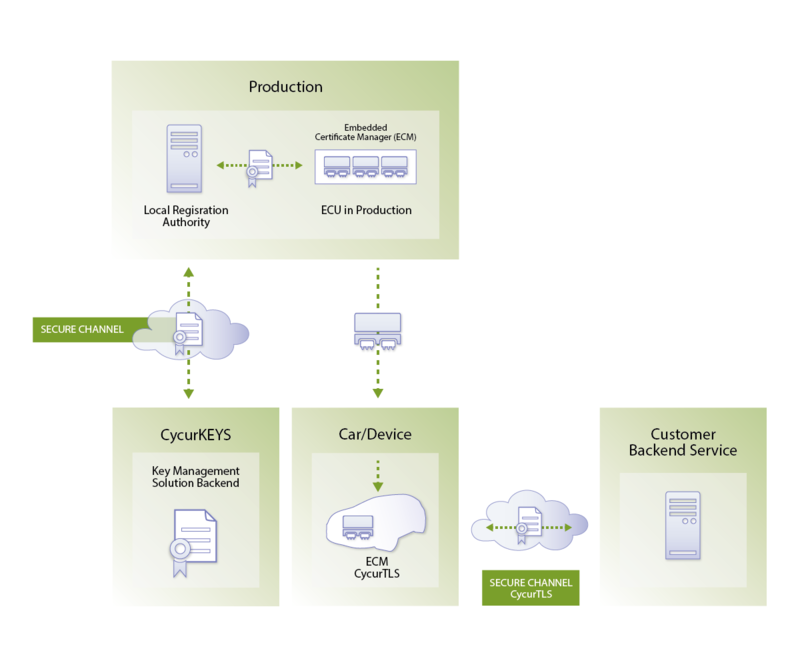 Over a secure connection, certificates are automatically integrated into all devices during production (and, where necessary, renewed in the course of the lifecycle). With the help of appropriate device software (e.g, CycurLIB, ECM), these certificates enable the devices to authenticate and encrypt communication channels. Flexible, individual integration of the solution combined with ease of use – also available as a “fully worry-free” managed service – we operate it for you! Our CycurKEYS product is a security software solution that creates and manages cryptographic (symmetric and asymmetric) keys (PKI). The customer’s local registration authority (LRA) enables certificates to be automatically integrated into devices during production. The embedded certificate manager (ECM) manages the device’s digital ID. Our CycurTLS product establishes secure connections.